Nowadays, Android-based electronic products Android phones and Android tablets are distributed everywhere. Many Android users find it extremely convenient to watch videos on their Android devices either on Android phones or Android tablets. There are many video formats supported by Android devices, including video formats of H.264 video codec, of MPEG4 video codec. However, Android devices cannot directly play DVD video, which makes many DVD video fans try to find a good solution to acheive their aim of watching DVD video on their Android devices. Fortunately, there indeed is a good way to bypass the DVD format restriction on Android devices: to convert DVD to Android by choosing a DVD to Android converter to rip DVD to Android playable format.In this article, we’ll make a review on some DVD to Android converters. As a professional DVD to Android converter, Brorsoft DVD Ripper helps users rip both homemade and commercial DVD to Android devices at lightning speed while holding the original video quality. It is easy for users to operate as the main interace of the program is user-friendly. Read the tutorial below carefully to grasp the steps to rip DVD to Android. Run DVD Ripper and click DVD icon to add DVD source files from your computer. All the loaded files will be listed on the left item bar and you can preview them on the right. Click Format bar to get the format list and select a proper export format. After all these have been prepared, just click the “Convert” button to begin the DVD to Android conversion. For watching DVD movies on Android phones and tablets, users have to rip DVD to Android phones and rip DVD to Android tablets. For such ripping purpose, users can take advantage of Aimersoft DVD Ripper. With fast ripping speed and excellent output video quality, Aimersoft DVD Ripper is designed to rip DVD to Android phones and Android tablets compatible video formats. If you are using a Mac, please turn to the Mac version counterpart called Aimersoft DVD Ripper for Mac to convert DVD to Android on Mac OS. Get the DVD ripper now and then rip DVD to Android for freely enjoying your favorite DVD movies on your Android phones and tablets like Samsung Galaxy S7, Amazon Nexus 7, Kindle Fire, Nook Tablet, HTC Flyer, Acer Iconia Tab, etc. Click the “Load DVD” button on the top left to add the DVD movie file to the ripper. After the DVD files are loaded, you can preview them on the right viewing window and take snapshots of your favorite movie scene. ISO and IFO files are also supported. For Android phone, simply choose HTC > Android OS as the output video format. For Android tablets, you can either find the tablet icon and select it as output format or simply choose “Common Video” >”MP4 Video”. When all the settings are OK, click “Start” button to start converting DVD movies for playback on Android devices. When the conversion is over, click “Find Target” to locate the ripped video files. After that, you can connect your Android phone or tablet to computer via a USB device and transfer the videos to your device for enjoyment on the go. Get the program and start to convert DVD to play on any Android devices. By enabling users to convert DVD to Android, to rip DVD to tablet, WinX DVD Ripper is a useful DVD to Android converter. It is able to rip both homemade DVD and commercial DVD by extracting the audio and video content of DVD to a digital video file playable by Android phone and tablet. Free download WinX DVD Ripper and then start to rip DVD to Android. If you are a Mac user, please download Mac version of WinX DVD Ripper. The following tutorial is taking Windows version as an example. Step 1: Insert one DVD disc in your DVD-ROM before or after clicking “DVD Disc” button on the software UI. Step 2: Choose the proper format and parameter for your Android device. You can choose HTC (or Samsung) according to your device, and then find the suitable one among the ready-made profiles for Androids. Or you can search online first for the video parameters supported by the Android device, and then find an identical or approximate one among the profile items. 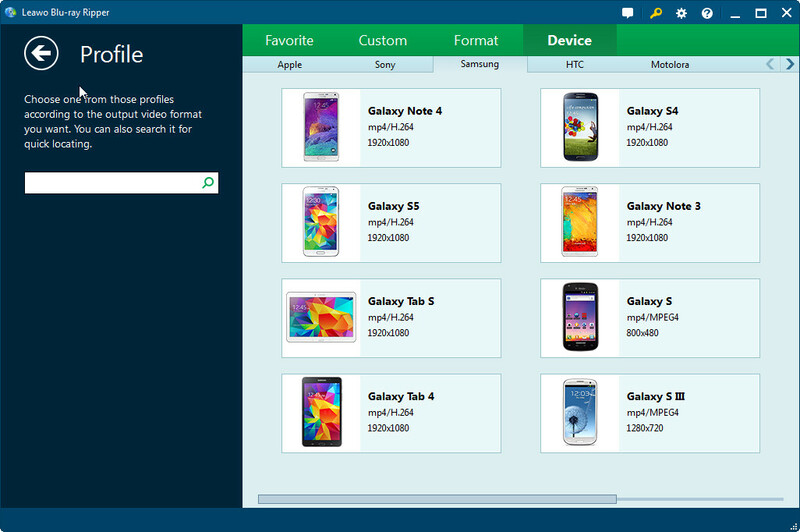 Step 3: Browse to choose the output folder, check the DVD title needed to rip in the title list on the upper part (generally, the main title is default), and click “Start” button on the main interface, to start free converting DVD to Android device or phone. Among many DVD to Android converters, Leawo DVD Ripper stands out from the crowd and unquestionably becomes the best DVD to Android converter. It helps users rip both homemade and commercial DVD to Android tablet, rip DVD to Android TV and smartphone at lightning speed with high video quality. Its intuitive interface is quite easy to operate. Users can rip DVD to Android in just a few clicks. Why Leawo DVD Ripper is the best DVD to Android converter? Leawo DVD Ripper is able to rip DVD to Android, no matter it is commercial or noncommercial DVD. And it can remove DVD discs region limitation for better DVD movie enjoyment. Leawo DVD Ripper has the ability to rip DVD to output formats supported all Android-based devices like Samsung Galaxy S4, Galaxy Note 8, HTC One X, Kindle Fire HD, Google Nexus 7, and so on, at your disposal. Leawo DVD Ripper is designed to rip DVD at lightening speed yet with original quality reserved. Bad navigation and non-intuitive interface are certainly deal-breakers for a DVD to Android converter. However, Leawo DVD Ripper is designed with intuition in mind because it leads to users easily operating and navigating the software without encountering any complications. Free download Leawo DVD Ripper before you start to rip DVD to Android. The following simple steps will show how to rip DVD to Android with the best DVD to Android converter – Leawo DVD Ripper. Click “Add Blu-ray/DVD” button to load source DVD. Click the drop-down box (named “MP4 Video” by default), and choose “Change”, and then click “Device” to choose your Android device. If mouse stays on the format option, there will appear an “Edit” icon for you. 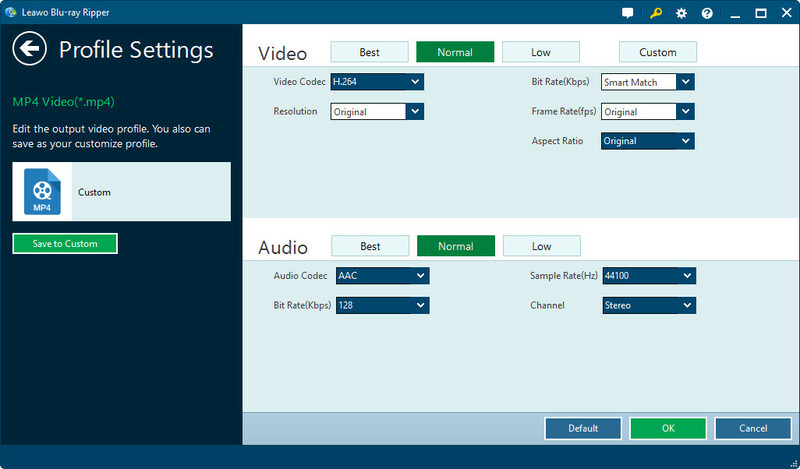 Click it to adjust video and audio parameters of output format, including: video codec, quality, bit rate, frame rate, aspect ratio, channel, audio codec, resolution, etc. Click the big green “Convert” button on the top-right of the interface to start to convert DVD to Android.